Royal Caribbean offers a 7-night journey with stops in St. Thomas, St. Kitts, and Aruba to name but a few. No one does the Caribbean like Royal Caribbean does, which makes them experts on the islands and the ocean that the liners call home. What southern Caribbean cruises would be complete without stops at St. Maarten, St. Lucia and St. Kitts? Carnival offers many cruises to all of these magnificent islands aboard their ‘fun ships’ with enough activities to keep the whole party entertained. If you are looking for a smaller, more intimate ship, then look no further than the Sea Dream Yacht Club. They offer a ‘yacht’ atmosphere with no rules, no structure and plenty of water sports and ‘toys’ to keep everyone happy. Their 7-night trips include stops in smaller ports of call like Soper’s Hole, Norman Island and Saba. Cruises from San Juan include offerings from Celebrity, known for its luxury take on cruising. This 7-night trip stops in Bridgetown, Castaries, St. John’s and Philipsburg, among others. Fine dining, impeccable accommodation and the attention to detail make Celebrity a great choice. Silver Sea offers a 7-night cruise aboard their more intimate ships leaving Puerto Rico and featuring stops in Basseterre, Roseau, Spanish Town and others. If you like smaller vessels, less people and less stress, this is one of the best Caribbean cruises that you can take. Celebrity offers one way cruises from San Juan that visit Bermuda, Charlotte Amelie, and Miami before you disembark in New Jersey. A great end of a fantastic vacation in Puerto Rico, when you choose this route home. One way from San Juan to Miami with stops in St. Kitts, St. Maarten, Antigua and Grand Turk is offered on Carnival’s fun ships. This 8 day vacation offers great islands and beautiful days at sea on a sensational ship. 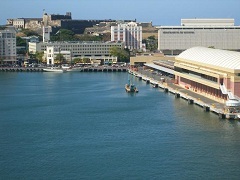 With so many things to do in San Juan, you will never be bored when waiting to depart on your cruise. Whether you live in Puerto Rico or are just visiting, taking cruises from San Juan take you to incredible destinations from an equally incredible port.